The Force is strong with your four-person team. Ready for a new Star Wars game on your mobile devices? We certainly are. Disney Interactive announced that it will release Star Wars: Assault Team this spring for iOS, Android and Windows devices. It's a turn-based combat game where you build a team of characters to face off against Imperial forces using a number of tactics and techniques. 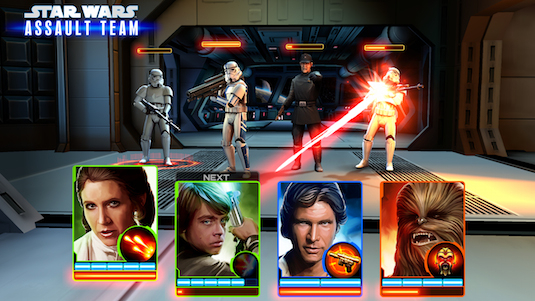 Featuring graphically enhanced missions set throughout the Star Wars universe from the original film trilogy, as well as a variety of characters that are sure to be nostalgic favorites, Assault Team also features the ability to take on fellow players with card-battle elements. Limited early access will be available soon, and the game will launch sometime this spring. Be sure to check back for full coverage once it arrives. Do or do not - there is no try!